Escape From An Eritrean Prison : Parallels Thousands of prisoners are held in detention camps throughout Eritrea, according to Amnesty International. Here's the story of one man who made it out. 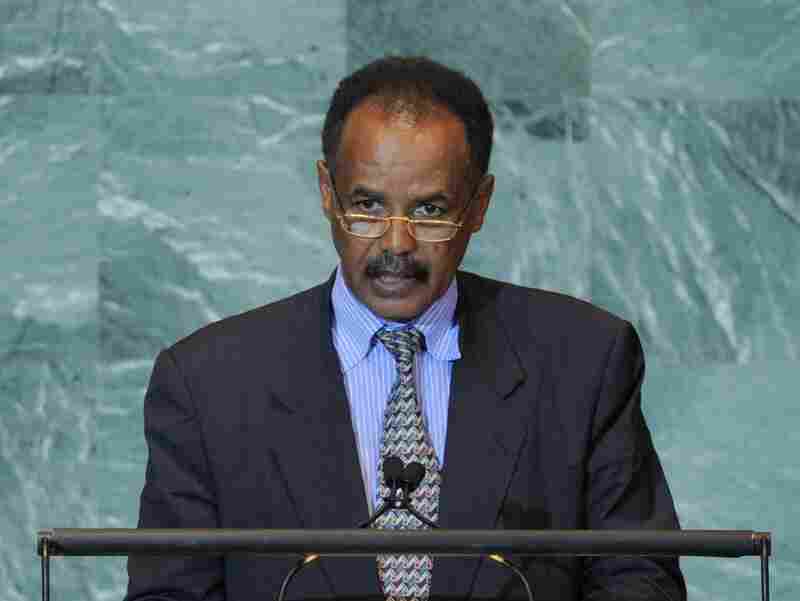 Eritrea's human rights record has long faced international criticism. Located in the Horn of Africa, the country is home to five million people, but so closed to the outside world that individual stories tend to come almost exclusively from those who have fled. Kidane Isaac was just 18 when he says Eritrean authorities arrested him for an unspecified crime. It's possible he was suspected of planning to desert military service. Thousands of Eritreans flee the country every month, many of them teenagers, to escape the mandatory and indefinite military conscription. Isaac was eventually taken to a remote prison, where he says he was confined with dozens of other prisoners in a shipping container with metal walls that amplified the hot desert days and freezing desert nights. "The food was two lumps of bread a day," he said. "Into the night I could hear cries of people being tortured." Though Isaac was only vaguely aware of it then, his prison was just a small part of a vast network of detention facilities scattered across the Eritrean desert. Some are well-known in Eritrea, while others are in secret locations and visible only on grainy satellite images. A map of these detention camps was released earlier this month by Amnesty International. The group's researchers report that the thousands of political prisoners held there include "members of the government, judges, journalists, former independence fighters, workers for NGOs," as well as people suspected of criticizing the government and family members of people who've fled the country. After almost a year in the shipping container, Isaac transferred to a labor camp where he watched men dying of malaria, of untreated wounds, and of fatigue. His early resolve to escape, he says, gave him the mental strength to endure. "As soon as I arrived, some of the prisoners who had been there for years told me to 'Run, run now.' " he says. "The chance of success was very small, but I decided to try, while I still had my strength." His break came six months later. Isaac watched the moon go behind a cloud just as his guard was distracted taking another prisoner to the latrine. Isaac and five companions ran. "We heard the sounds of gunfire behind us," he says, but it was so dark that all of them got away. Isaac walked to Eritrea's capital, Asmara, the city of his birth. He hid not far from his own home and bed, but was unable to contact his family or even send them word that he was alive for fear their homes were being watched, and he'd be discovered and recaptured. Eventually, he found some smugglers to take him across the border, where he arrived in a refugee camp in Sudan. It took several years, but eventually he ended up in Tel Aviv, Israel, where I reached him by Skype. It was only after he escaped the country that Isaac was able to send word to his family that he was alive. According to Amnesty researchers, the vast majority of prisoners' families are not informed of their whereabouts, and often never hear from a relative again after they are arrested. "And because your closest neighbor could be a spy," Isaac says, "you don't speak about these things — to anybody." He holds out the hope that in time his fellow prisoners will be set free. Then will come a day even harder to imagine: a homecoming with his family in Eritrea.